Had we been shovelled onto a grimy conveyor belt and pitched alongside millions of innocents into the inferno of the Great War (1914-18), there is a strong chance we would have had a musical companion. An emollient for the mental and physical agonies of front line duty. Portability, cost and availability predetermined the choice of instrument. And while a variety found their way to the front, it was the humble harmonica that became the proprietary antedote to the sting of industrialised warfare. And it’s probably the reason why so many Europeans still relate stories of a family elder who played the mouth organ. This Remembrance Day is no different to any other – they are equally important. As Santayana famously wrote: Those who cannot remember the past are condemned to repeat it. It’s just that this year we have the novelty of an extra number 11. 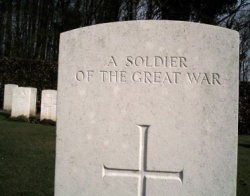 At the eleventh hour (GMT), on the eleventh day, of the eleventh month – of the eleventh year – we remember the fallen.